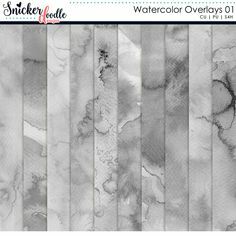 Hi, it’s Beatrice, and I’m excited to be back on the blog today to share with you my experience with SnickerdoodleDesigns’ latest release, “Textures”. I call these stash-builders because you can change the look of any paper many ways by simply adding one of these textures on top. Karen has a tutorial specific to this technique: Stretching your Digi-Stash using Textures and Overlays. I created a simple layout using Snickerdoodle Designs’ Winter Wonderland Collection and a template by Heartstrings Scrap Art. Then I added a texture, specifically 01-5, from the new Textures Collection 01. The difference is subtle, but I think you’ll agree, the added texture creates depth and adds character to the page. Karen has more samples in her February 11 blog post. She has also generously provided a freebie for you to experiment with! Just click on the image below to download! Once you try this, I am certain you will want to add the collection to your stash! Before I leave the blog I’d like to show you a few more pages using Winter Wonderland Collection. I really like this mix of masking and brushwork Glori used in her layout, Bye. Combining the framed photo with the masked photo is an eye-catching technique. I love all the elements clustered behind the photo and the journal card placed on top with a subtle shadow so it appears to blend into the background. Great title work and journaling finish off the layout just right. Gorgeous and icy perfectly describes the layout, Winter Frost, by Rochelle86. 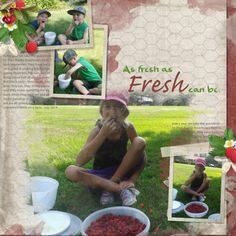 She used a template from Droplet Collection 3. I really like the way the photos take center stage here. The icy tree she chose for the background is the perfect backdrop for the smaller, close-up photos. The circle of striped paper adds a bit of interest and using the black paper for the border and title is the perfect choice for the dramatic photos. Finally, Clear and Cold by dj_w, is another wintery page with a completely different look. 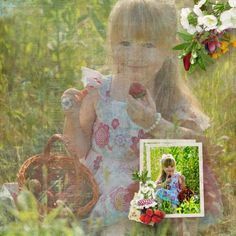 She used a template by Heartstrings Scrap Art. I really like the cut out paper trees and the snow swirls whirling about. The clusters are so pretty and the sprinkling of stars is the perfect added embellishment. I’ll finish off my post now with a reminder to participate in the Use It All Challenge at The Digichick which includes a free mini from Snickerdoodle Designs. This is a pretty sampler that coordinates with the Winter Wonderland Collection.